Due to overwhelming customer requests, Abita Brewing Company, a leading craft brewer, made their most popular flagship brews available for purchase in cans. Utilize an existing print media buy to create awareness and sales for the new can offerings. Fridge used augmented reality to add engagement to print ads – typically a static medium. Readers were prompted to scan the ad's embedded QR code with their smart phone. On their phone, users were able to "see inside the can" and tap the beer carbonation bubbles on their screen to reveal live tweets. 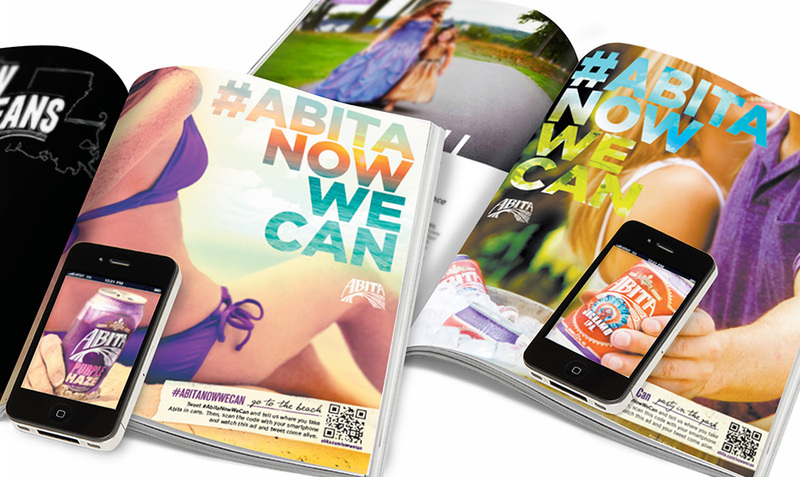 The live tweets were generated from a Twitter ad buy encouraging Abita customers to share their excitement about the availability of cans using the #AbitaNowWeCan. Abita's sales of the new cans took off and the campaign generated thousands of social engagements. Abita also gained a significant number of fans/followers to its official social media profiles.